A few months ago I took a little run through the Canadian Rockies. I ran 78 miles to be exact and when I crossed the finish line of this race known as the Canadian Death Race (because if you finish you probably cheated death) I had achieved something that only 35% of the people who started as solo runners did. Now there were many factors in this. As a matter of fact, I am in the process of writing a book about the experience but I can distill it down to a few biggies. And it’s one of those biggies I want to tell you about now. After attempting to come down one of the mountain sides in practice I realized there is no way my quads and my legs are going to survive such a race. Enter “Dr. Death” also known as Dale, the originator of the Death Race. After a 5 minute session on trekking pole use, I was set and I found them to be one of the major keys to completing such a long, hard race over such difficult terrain. They especially helped me literally fly down the mountain sides without breaking my neck. This helped make up for my less than stellar speed on the climbing side of things. So when I got back from the Death Race I decided that just about any run on any trail I would take would see my trusty trekking poles by my side. Thus when I showed up at some shorter races in my local area I got a bunch of funny looks and a few comments about “the dude with the ski poles”. Most had never even seen them let alone seen anyone using them. What my running friends didn’t know is that trekking polls stand poised to be “the next big thing” along with band training in the fitness industry. And with good reason, they help you burn more fat. 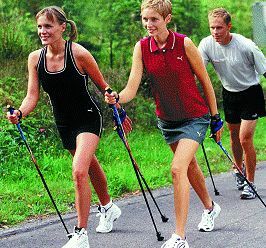 I could go on and on about why I use trekking poles for my trail runs, but the main reason I want to bring them to your attention is that recent studies in the Journal of Strength Conditioning Research have shown that they increase the calorie burn without increasing the perceived exertion of the exercise. So whether you walk or run, you burn more calories and you don’t feel more tired. It has been estimated that you actually burn about 20% more calories using the poles because they engage your upper body and core. So if you are looking for a way to improve your walking/running efficiency in terms of calorie burning this is a great way to do it. And if like me you live in areas of ice and snow in the winter, the poles behave like extra legs so now you have 4 legs instead of 2! Get out, move and enjoy!